The Locarno Treaties were seven agreements designed to adress the post-war territorial settlements and normalizing relations with defeated Germany. The Kellog-Briand pact was signed August 27, 1928, by the United States, France, the United Kingdom, Italy, Japan,Weimar Germany and a number of other countries. It renounced war as a means of settling disputes, it was unsuccessful in doing so. 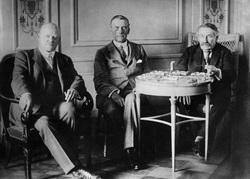 The Kellog-Briand Pact prohibited the use of war as "an instrument of national policy"